The World Affairs Council of Las Vegas is a non-profit 501(c)(3) non-partisan member organization of the World Affairs Councils of America and GlobalTIES US. We are one of over 100 grassroots organizations across 40 states and the District of Columbia dedicated to engaging and educating Americans on international affairs and foreign policy. 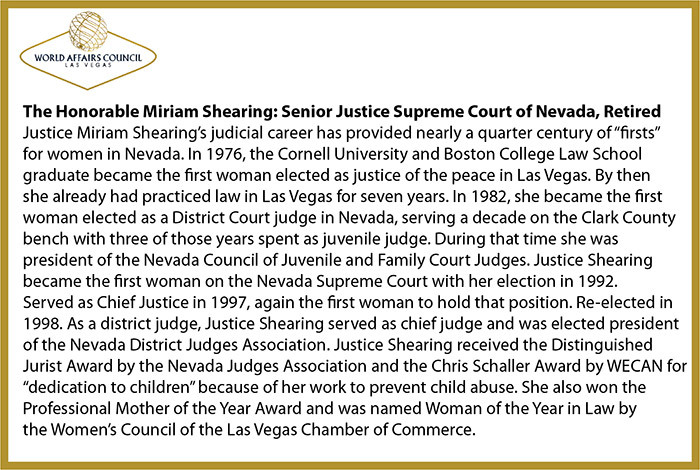 Our mission of “enhancing global understanding” focuses on the development and execution of programs that benefit education, business, and government within Southern Nevada. We maintain an open membership policy and strive to find opportunities for anyone who wishes to volunteer. Click here to learn more on what we offer, opportunities for you and the community. 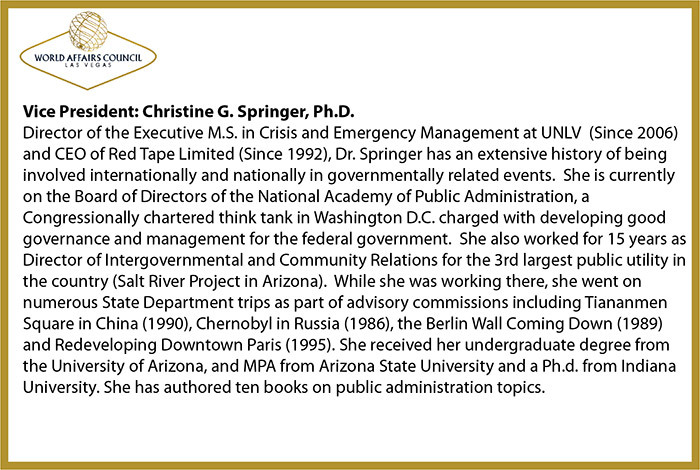 Vice President: Christine G. Springer, Ph.D.
Director of the Executive M.S. in Crisis and Emergency Management at UNLV and CEO of Red Tape Limited. Click here for full bio. 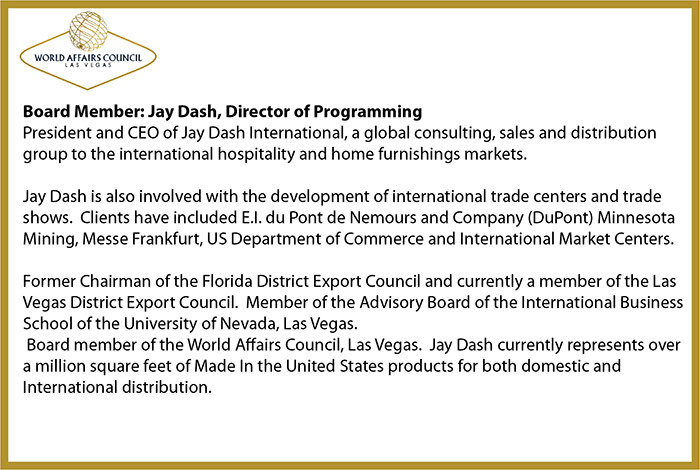 President and CEO of Jay Dash International. 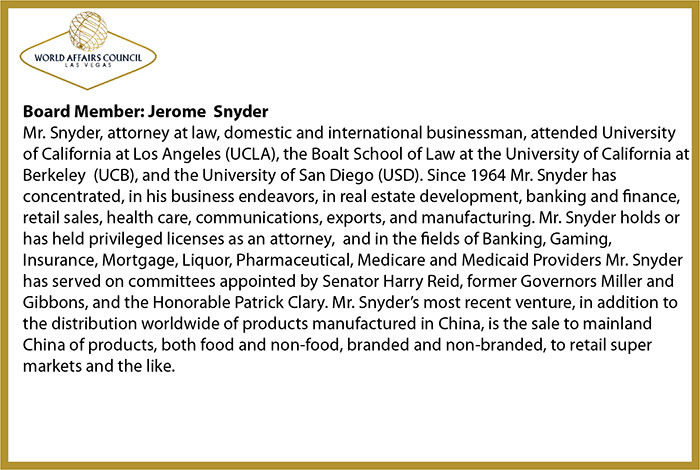 Click here for full bio. 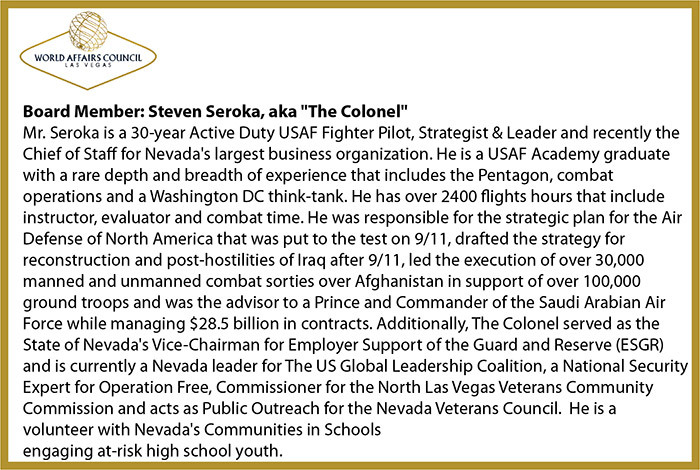 Dr. Jabber is the founder of Globicom Inc.
Mr. Seroka is a 30-year Active Duty USAF Fighter Pilot, Strategist & Leader and recently the Chief of Staff for Nevada’s largest business organization. Click here for full bio. businessman. Click here for full bio. 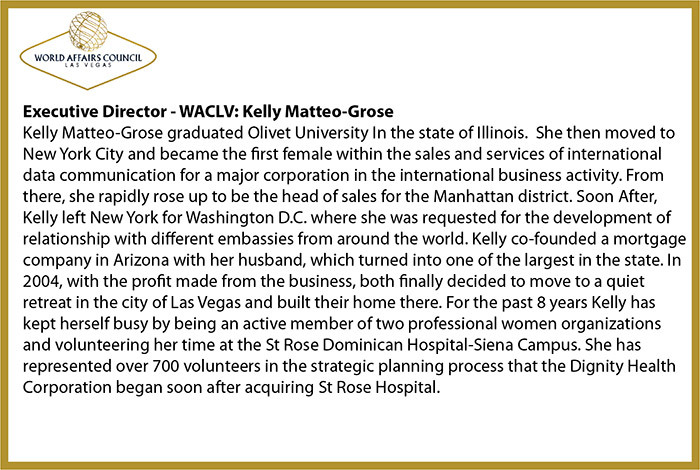 Began her career in international business at American Express Co. for 18 years. 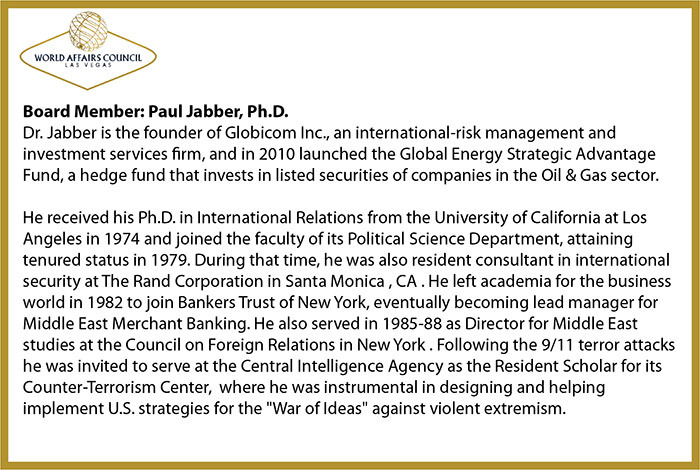 Click here for full bio here. President: Lena Walther, Immediate Past President: Stan Parry, Secretary and Board Member: John Petkus, Board Member: Barbara Wood, Public Affairs Chair, Board Member: Barbara Harff (Ph.D.), Program Committee, Board Member: Annette Whiteside, Board Member: Vivian Palmer, Board Member: Matthew McNeelege, Past Director of International Visitors Program, Board Member: Ronald Kline, MD., Board Member: Elfie Manning, Director of Education and Board Member: Nighat Abdulla, Director of Events. 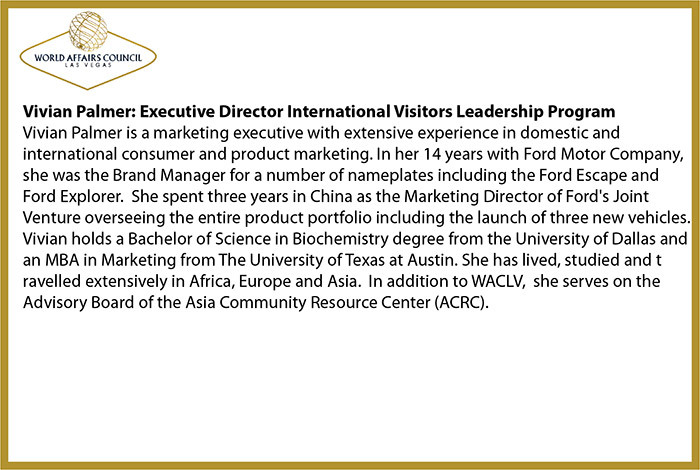 Vivian Palmer is a marketing executive with extensive experience in domestic and international consumer and product marketing. Click here for full bio. 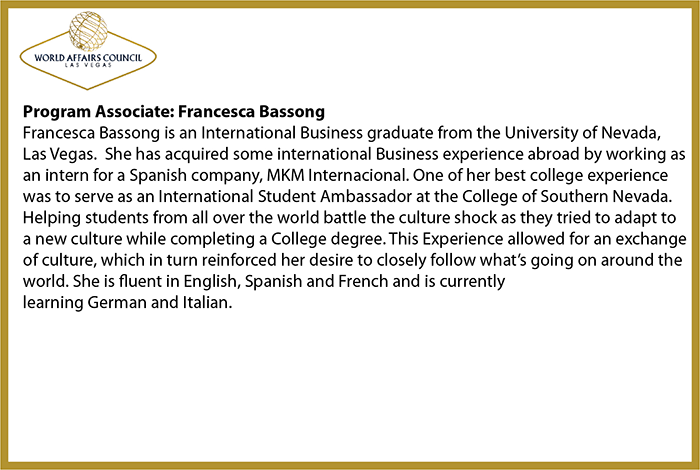 Francesca Bassong is an International Business graduate from the University of Nevada, Las Vegas.Click here for full bio.